ANCHORAGE, Alaska — The Trump administration announced a series of steps yesterday designed to kick-start oil drilling on federal lands in Alaska and to reject the land preservation policies adopted under former President Obama. Speaking at an Alaska Oil and Gas Association conference here, Interior Secretary Ryan Zinke unveiled plans to update the government's resource assessment for the Arctic National Wildlife Refuge and to open new sections of the National Petroleum Reserve-Alaska to oil and gas leasing. Zinke also said that in the coming days, he will begin the long regulatory process of rewriting the five-year plan for oil and gas leasing along U.S. coasts, including in the Arctic Ocean. That action comes in response to President Trump's April 28 executive order directing the Interior Department to review offshore oil and gas drilling in the Arctic, the Atlantic and the Pacific outer continental shelf regions. "The president has tasked me to prepare our country to be energy dominant," Zinke told a crowd of cheering Alaska oil industry supporters. "The only path for energy dominance is a path through the great state of Alaska." At the conference, Zinke signed a new secretarial order, 3352, giving his staff three weeks to develop a schedule for revising the land management plan for the NPR-A, a 23.6-million-acre federal property in northwestern Alaska. 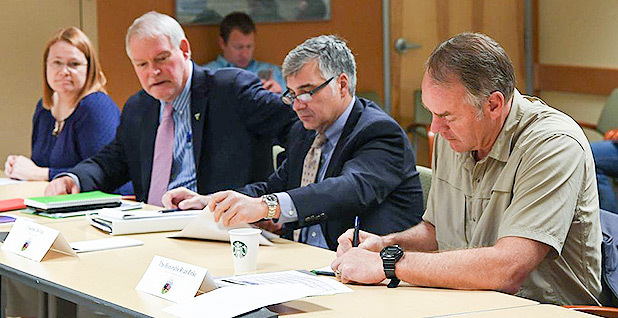 The order also lays the groundwork for a new assessment of the technically recoverable oil and gas in the petroleum reserve, as well as on ANWR's 1.5-million-acre coastal plain. "This order in effect makes Alaska open for business," Zinke declared. The Interior secretary said he'll allow oil companies to conduct new seismic surveys in the northern plain of the Arctic refuge, also known as the 1002 area. "I don't expect the U.S. government and the state to do all the seismic evaluation," he told reporters after his speech. "I want to invite industry to take a look at it, too." No seismic studies have been permitted on the coastal plain since a group of companies ran 2-D surveys in the 1980s. Based on those reports, the U.S. Geological Survey's 1998 assessment estimated that the region contains a mean volume of 10.4 billion barrels of oil. But USGS scientists recently noted that the coastal plain contains rock formations that are nearly identical to the oil-rich geological structures that have been discovered at three promising new oil finds in northern Alaska. Based on those findings, ANWR could contain more petroleum than early studies suggested (Energywire, May 30). No matter what those geological surveys find, however, leasing cannot begin in the 1002 area without congressional approval. Over the last 30 years, national conservation groups and Senate Democrats have repeatedly thwarted Republican efforts to allow drilling on the coastal plain. The Trump administration's recent budget proposal called for the government to sell oil and gas leases in ANWR and predicted that those leases could raise $1.8 billion by 2027. Meanwhile, Zinke said, he is ordering a new management plan for the NPR-A, with an eye toward opening oil and gas leasing in parts of the reserve that are now off-limits. The Interior secretary criticized the Obama administration's 2013 land management plan for barring oil development on large swaths of hydrocarbon-rich lands in the preserve, particularly a large piece of land around the 22-mile-wide Teshekpuk Lake. "Why would you put the most productive tracts off-limit?" Zinke asked. The 2013 integrated activity plan for the petroleum reserve reasoned that those lands should be protected as critical habitat for migratory birds, caribou and other wildlife populations. Zinke's announcement marked the end of the Interior secretary's six-day trip to the Arctic with Alaska Sen. Lisa Murkowski (R) and four other U.S. senators. The journey began Friday with visits to Norway and Greenland. The group also made stops at Alaska's North Slope oil facilities and the Denali National Park and Preserve (E&ENews PM, May 30). Murkowski, chairwoman of the Senate Energy and Natural Resources Committee, noted that throughout the trip, Zinke repeatedly called for new North Slope oil production to stop the declining oil flow in Alaska's Trans-Alaska Pipeline System. The pipeline is currently operating at about one-quarter capacity. "That's the kind of guy we're talking about; this is not Sally Jewell we're talking about," Murkowski asserted, referring to the Obama administration's Interior secretary, who staunchly advocated land preservation. The Interior secretary's plans drew praise from House Natural Resources Chairman Rob Bishop (R-Utah), who said the action "further demonstrates the Trump administration's commitment to harnessing America's domestic energy resources to support economic growth, empower local communities and bolster security objectives abroad." But conservation groups supported the Obama administration's action to protect the Arctic landscapes and attacked the Trump administration's proposals. Nils Warnock, the National Audubon Society's executive director for Alaska, asserted that Zinke's effort to scrap the existing land-use policies "ignores the balance already achieved in the 2013 NPR-A plan, which came after lengthy consideration of many perspectives and the best available science." The Wilderness Society's Alaska regional director, Nicole Whittington-Evans, argued that the Arctic refuge should be protected as a national treasure. "We need to continue to protect and preserve the Arctic National Wildlife Refuge, which has values far beyond whatever oil might lie beneath it," she said. "Some places are so special that they should simply be off-limits," she said, "and the Arctic refuge really is ... too wild to drill." This story also appears in Climatewire.